The art of paper cutting first emerged from the earliest attempts to give physical form to a vast body of oral legend. From early rituals that involved primitive animal sacrifices, a new ritual was formed where paper substitutes bearing resemblances of the gods were burned to show their deep respect. These representations, known as zhima (“paper horses”), grew from the conviction that winged horses acted as messengers between heaven and earth. Thus, the paper tributes were believed to fulfill a similar function by transmitting the vision of the paper images to the heavens above. Author’s Scott Minick and Jiao Ping relate that although the earliest forms of spirit worship have long since disappeared, many of these beliefs continue to play an active role in the paper arts of today’s rural Chinese, and the use of traditional paper tributes to ward off danger and celebrate the New Year remains a popular and widespread practice. The tradition of posting colorful New Year prints with images is intended to welcome the New Year and engender good luck. Paper cutting is the most practiced of all folk art and consists of two styles: the patterned cut where fewer holes are presented in the design and monochrome where more holes are included. The good fortune symbols created during New Years celebrations also serve as a form of protection. 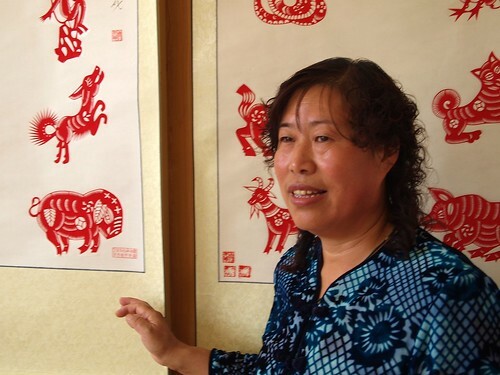 Many of the papercuts depict scenes from famous folk tales and bear descriptive titles, such as “Niang” or “Mice Eating Grapes.” The most recurrent images tend to be those of the twelve Sheng Xiao, or animals of the zodiac, which feature prominently among the decorations during their year of rule and are described below. The styles and characteristics of the decorative paper cuts may vary widely from region to region, but always correspond to one of two basic functions involving protective and curative properties or aspects of fertility. Paper cutting is also embodied in all aspects of folk custom and culture: window decoration; border flower for brick bed; cave-vault flower; totem door god; daily life appliance such as vat and jar flower; porcelain decorations; dress and adornment like embroidery, hat decoration, shoe flower, pillow case and undergarment decorative patterns; and for a wedding ceremony, memorial service, birthday celebration, etc. Red is the color that traditionally signifies happiness. Yellow, green and multicolored papercuts announce the approaching of spring. 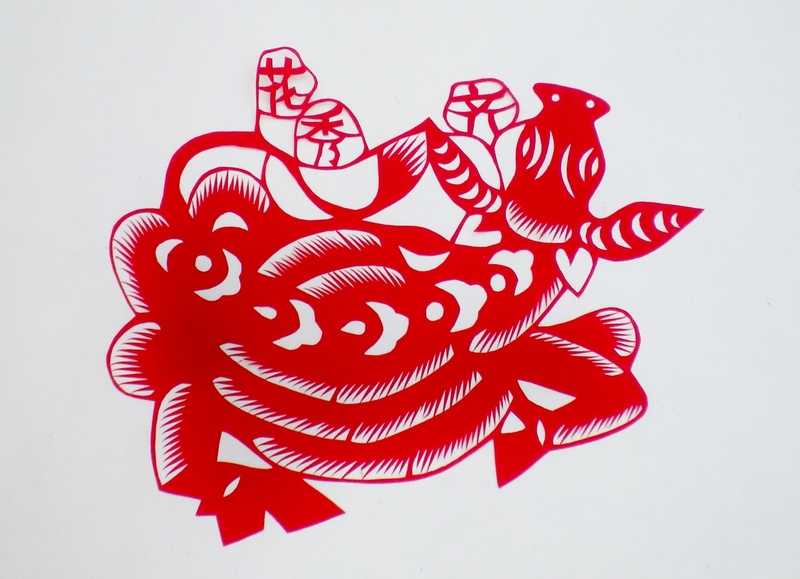 Some of the most common subjects in paper cutting are the animals of the Chinese Zodiac. These creatures are linked with both the year and month within that year as described below. Traditionally they have held great significance to the Chinese people, just as astrological signs did to Europeans, and they continue to be widely known today. The Rat is the first sign of the lunar cycle. The direction appointed to the Rat is directly north; its season is winter and its principal month, December. The Rat corresponds to the Western astrological sign of Sagittarius which rules winter from November 22nd to December 21st. Water is its fixed element and the Rat has a positive stem or is considered a yang or male sign. The Ox is the second sign of the lunar cycle. The direction appointed to the Ox is north-northwest; its season is winter, and its principal month, January. The Ox corresponds to the Western astrological sign of Sagittarius which rules winter from December 22nd to January 20th. Water is its fixed element and the Ox has a negative stem and is considered a yin or passive sign. The Ox symbolizes the attainment of prosperity through fortitude and hard work. A person born during this year will be dependable, calm and methodical. A patient and tireless worker, they stick to routine and convention. Although they are generally fair-minded and good listeners, it is difficult to persuade them to change their views as they are stubborn and often have strong prejudices. The Tiger is the third sign of the lunar cycle. The direction appointed to the Tiger is east-northeast; its season is winter and its principal month, February. The Tiger corresponds to the Western astrological sign of Aquarius, which rules the sky from January 21st to February 19th. Wood is its fixed element and the Tiger has a positive or yang stem. In Eastern culture, the Tiger symbolizes power, passion and daring. A rebellious, colorful and unpredictable character, they command awe and respect from all quarters. This fearless and fiery fighter is revered as the sign that wards off the three main dangers to a household: fire, thieves and ghosts. The Rabbit is the fourth sign of the lunar cycle. The direction appointed to the Rabbit is directly east; its season is spring and its month, March. The Hare corresponds to the Western astrological sign of Pisces, which rules from February 20 to March 20th. Wood is its fixed element and it has a yin or negative stem. A person who is born in the year of the Rabbit is considered very fortunate. The Rabbit, or Hare as they are referred to in Chinese mythology, serve as the symbol of longevity and are said to derive their essence from the moon. The Rabbit is the soul of graciousness, good manners, sound counsel, kindness and sensitivity to beauty. The Dragon is the fifth sign of the lunar cycle. The direction appointed to the Dragon is east-southeast; its season is spring and its principal month, April. The Dragon corresponds to the Western astrological sign of Aries, which rules spring from March 21st to April 19th. Wood is its fixed element and the Dragon is considered a yang or male sign with a positive stem. A person born a Dragon is magnanimous and full of vitality and strength. To them, life is a blaze of colors, and they are constantly on the go. Egotistical, eccentric, dogmatic, whimsical or terribly demanding and unreasonable, they are still never without a band of admirers. Proud, aristocratic and very direct, the Dragon-born establishes their ideals early in life and demands the same high standards from others that they have set for themselves. The Snake is the sixth sign of the lunar cycle. The direction appointed to the Snake is south-southeast; its season is spring and its principal month, May. This sixth lunar sign corresponds to the Western astrological sign of Taurus, which rules the sky from the 20th of April to the 20th of May on the solar calendar. The Snake is a feminine or yin sign and it has a negative stem with Fire as its fixed element. Philosopher, theologian, political wizard, wily financier the Snake person is the deepest thinker and the enigma of the Chinese cycle. They are endowed with an inborn wisdom; they are mystics in their own right. Graceful and soft-spoken, they love good books, food, music and the theater; they will gravitate naturally toward all the finer things in life. The most beautiful women and the most powerful men tend to be born under this sign. The Horse is the seventh sign of the lunar cycle. The direction appointed to the Horse is due south; its season is summer and its principal month, June. The Horse corresponds to the Western astrological sign of Gemini which rules summer from the 21st of May to the 21st of June. Fire is the fixed element of the Horse and it is a male or positive yang sign. A person born in the Horse’s year will be cheerful, popular and quick-witted although their changeable nature may cause them to be hot-tempered, rash and headstrong at times. The unpredictable Horse native will fall in love easily and may fall out of love just as fast if they follow their capricious heart instead of their head. Earthy and warmly appealing, they are very perceptive, talkative and have a raw sensual appeal rather than straight good looks. They are noted for their love of sports, outdoor activities and fondness for animals. The Sheep is the eighth sign of the lunar cycle. The direction appointed to the Sheep is south-southwest; its season is summer and its principal month, July. The Sheep corresponds to the Western astrological sign of Cancer which rules summer from June 22nd to July 21st. Fire is the Sheep’s fixed element and it has a negative or yin stem. The Sheep is the most feminine sign of the Chinese zodiac. A native of this year is called the good Samaritan of the cycle. They are righteous, sincere and easily taken in by sob stories. They are likely to be mild-mannered, even shy. At their best, they are artistic, fashionable and a creative worker. At their worst, they tend to be easily overcome by emotions, depressed and withdrawn. The Monkey is the ninth sign of the lunar cycle. The direction appointed to the Monkey is west-southwest; its season is summer and its principal month, August. The Monkey corresponds to the Western astrological sign of Leo, which rules summer from July 22nd to August 21st. The Monkey is considered a male or yang sign and its fixed element is Metal. In the Chinese zodiac, the Monkey is the sign of the inventor, the improviser and the motivator, a charlatan capable of drawing everyone to them with their inimitable guile and charm. Being the quick-witted genius of the cycle, they are clever, flexible and innovative. The Monkey can solve intricate problems with ease and will be a very fast learner. They can master anything under the sun and usually have good linguistic aptitude. The Rooster is the tenth sign of the lunar cycle. The appointed compass direction of this lunar sign is directly west; its season is autumn and its principal month, September. This is a yin or feminine sign and its fixed element is Metal. The Rooster corresponds to the Western astrological sign of Virgo, which rules from August 22nd to September 22nd. The Rooster or Chicken is the Don Quixote of the Chinese cycle. The dauntless hero who must look to the earth to survive, they are the most misunderstood and eccentric of all the signs. Outwardly, they are the epitome of self-assurance and aggression, but at heart they can be conservative and old-fashioned. The Dog is the eleventh sign of the lunar cycle. The Dog’s appointed direction is west-northwest; its season is autumn and its principal month, October. The Dog sign is the eleventh in the Chinese cycle and corresponds to the Western astrological sign of Libra, which rules autumn from September 23rd to October 22nd. The Dog’s fixed element is Metal and its sign is denoted by a masculine or yang sign. The Dog may be the most likeable sign in the Chinese horoscope. A person born in the year of the Dog is honest, intelligent and straightforward. They have a deep sense of loyalty and a passion for justice and fair play. A Dog native is usually animated and attractive. Generally amiable and unpretentious, they will know how to get along with others and are not too demanding. The egalitarian Dog likes to meet others halfway, is always willing to listen to reason and can be counted on to do their share. The Boar is the twelfth sign of the lunar cycle. This lunar sign’s appointed direction is north-northwest; its season is autumn, its principal month, November. This is a yin or feminine sign and its fixed element is Water. The Boar of Pig sign is the twelfth and last in the Chinese cycle and corresponds to the Western astrological sign of Scorpio which rules from October 23rd to November 21st. This is the sign of honesty, simplicity and great fortitude. Gallant, sturdy and courageous, a person born in this year will apply themselves to an allotted task with all their strength. You can rely on them to see it through. Outwardly, they may appear rough-hewn and jovial, but scratch the surface and you will find pure gold.